“Life is not counted by the breath we take, but by the moments that take our breath away.” The day of your wedding is considered the most beautiful day of your life. We are convinced that this special day should be unique down to the last detail. The signature with which you seal your wedding vows may therefore rightly be described as “the most important signature of your life.” The Wedding Pen will forever keep this special memory for you. The Wedding Pen is supposed to be kept as a memory forever. That is why we have designed the Memory Box. 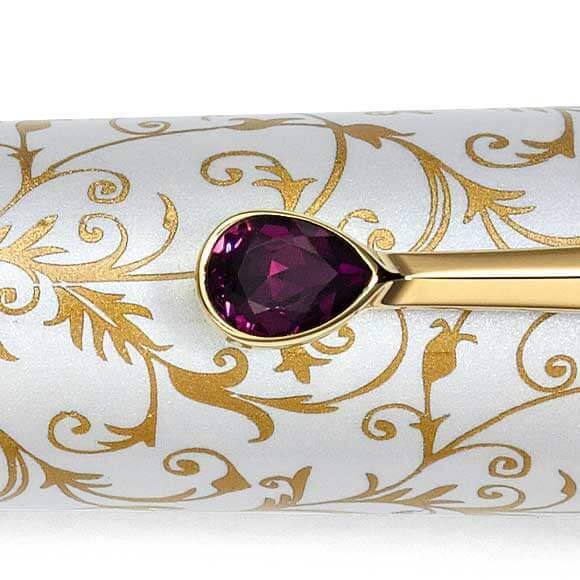 It is lined with fine purple velvet fabric and fitted with a viewing window, so that your Wedding Pen does not get dusty and is visible, even with the lid closed. The exterior color is a sparkling pearly white, matching your wedding. Inside the box, there is an engraved plaque covered with gold or platinum, depending on the model. Here, there is room for your common family name, your first names, the place and date of your wedding, and a text field for a personal message or quote. In addition, the box provides an area in which your wedding rings can be stored until the wedding, so that everything will be ready on the day of the wedding. We are certain that upon opening, the Memory box will enchant you and your guests. At first glance, it is clear that this writing instrument was designed for a special purpose – your wedding. Our design is based on the optics of the bride. 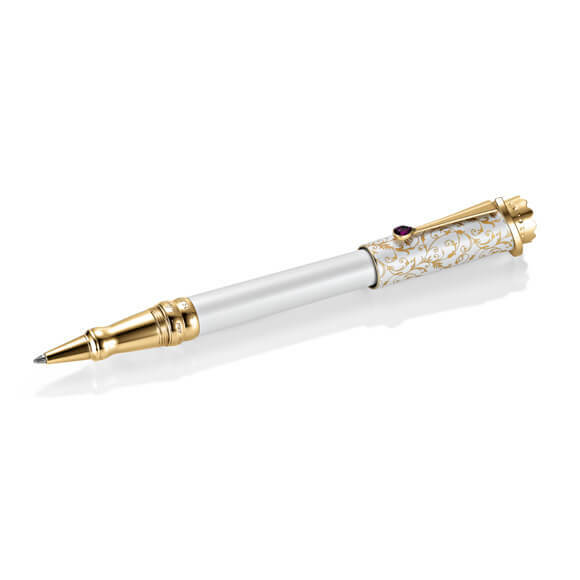 The pen features an elaborate multilayer paint finish in delicate pearly white, and the base material is solid brass covered with pure gold. The cap is decorated with an elaborate Baroque lace pattern, finished with a crown of amethyst-colored crystal by Swarovski. I only want to love you twice in my lifetime. 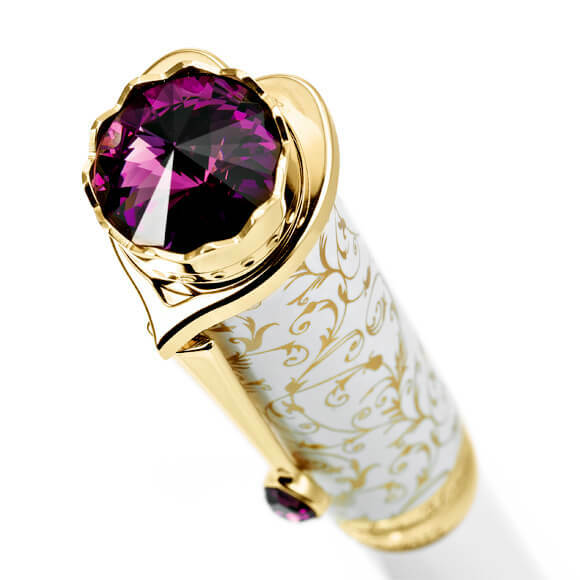 The purple crown (german: Lila Krone) is the trademark of the Wedding Pen and symbolizes every little girl’s dream of being “Princess for a day” and Queen for a lifetime. 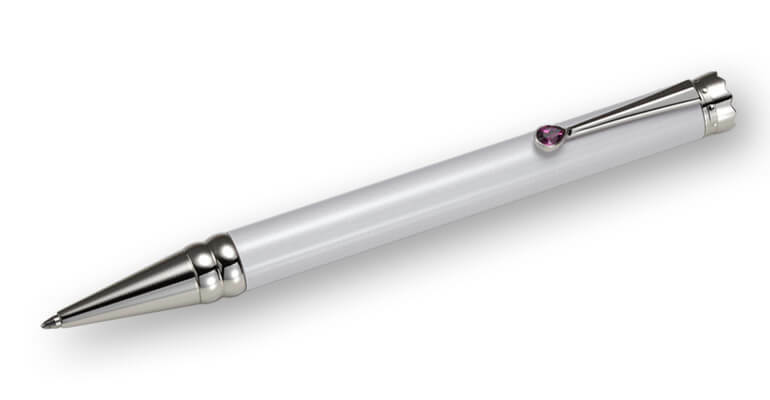 At the same time, it stands for the inventors of the Wedding Pen – the company “Lila Krone” in Pforzheim. Since the color purple rarely occurs in nature, it rightly stands for exclusivity and individuality. It also stands for dignity and wisdom. In ancient times, wearing the color purple was usually reserved for queens and members of the royal family. For this reason, the color is ideally suited for the Wedding Pen – the queen of writing instruments. We firmly believe that love is the key to true happiness, and it is our sincere wish that your love will last forever. 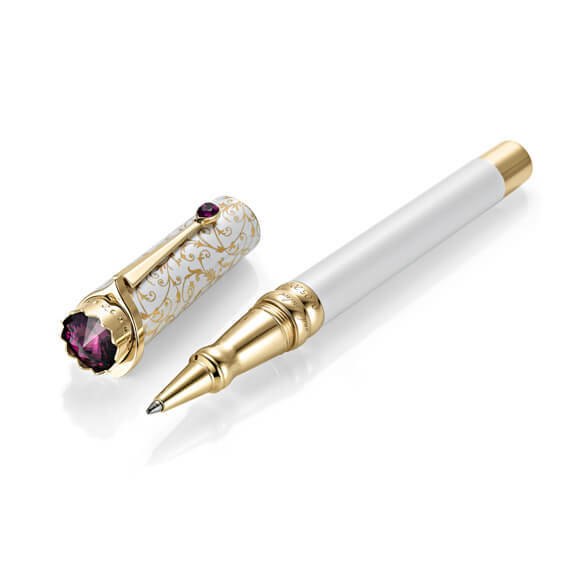 The elaborately finished clip of the Wedding Pen, which nestles around the cap like a precious necklace, forms a golden heart, when viewed from above. 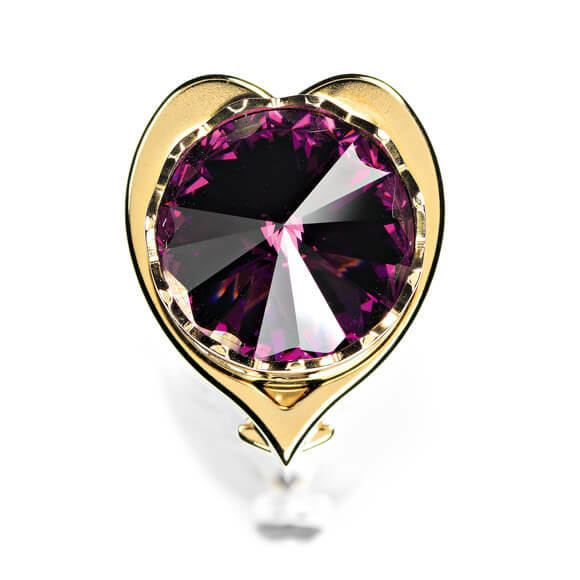 It symbolizes the eternal bond of love between you and your partner. The real crystal by Swarovski makes the heart glitter. Each moment shows your face. The focus of a wedding is the happy couple. 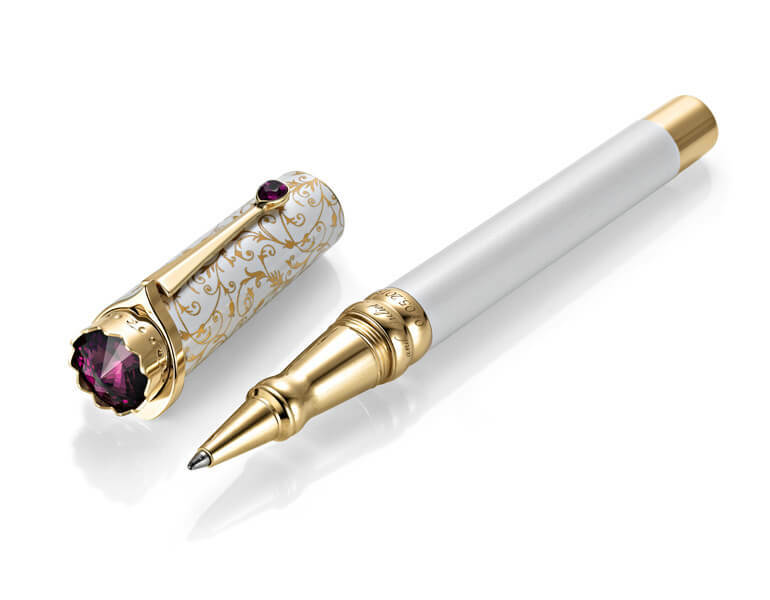 In the design of the Wedding Pen, the two customized rings form the central design element. They will always remind you of the exchange of your wedding rings. The first step in the manufacturing of the rings is the deep engraving of your names and the date of your marriage. It is then sealed with real gold. This means that your names are immortalized, which makes your Wedding Pen an absolutely unique piece. Sweet are the tears that love is drying. In the course of life, the odd tear is forgotten. For your future life, we wish you nothing but tears of joy. That is why we have enclosed a polished Swarovski crystal in the shape of a tear, also called a Briolette, at the end of the clip of your wedding pen. It symbolizes the last tear, forever captured, the beginning of a common life filled with joy and happiness. You and only you, for now and forever! Your love is supposed to last forever. Even your signature should still be visible in many years from now. That is why we use a specially developed, indelible ink for the Wedding Pen. It conforms to the standard for documents “ISO 12757-2 DOC”. With the use of a tungsten carbide ball, we guarantee a unique, smooth writing experience and maximum durability. After the wedding, you can therefore retrieve your Wedding Pen again and again and use it for key signatures during your joint life journey. This special pen is supposed to bring you happiness with all important signatures – for a lifetime. 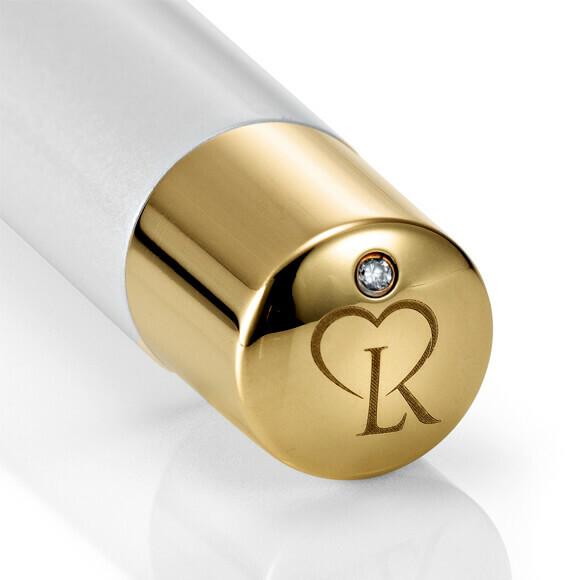 Your love is to be genuine, that is why we decorate each Wedding Pen with a genuine diamond. It is also a symbol for the home of the company, the “Golden City” of Goldstadt Pforzheim. Here, wedding rings and watches of unparalleled quality have been made for hundreds of years. 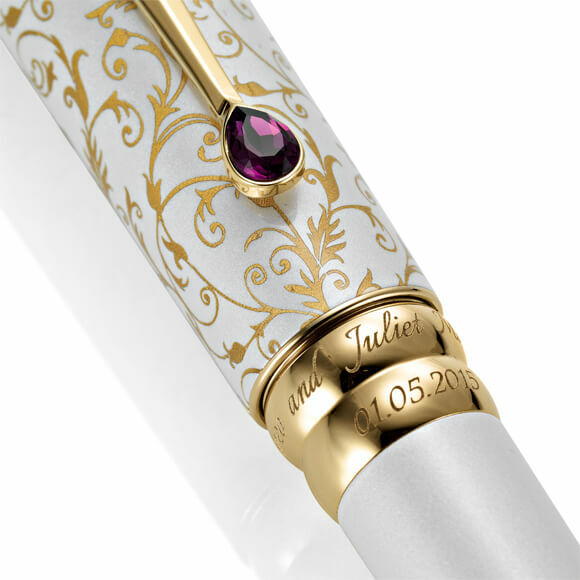 The company, in which the Wedding Pen is manufactured, also looks back on decades of tradition in the production of high-quality writing instruments made from precious materials.